c/o William Halliday, Photo Editor. 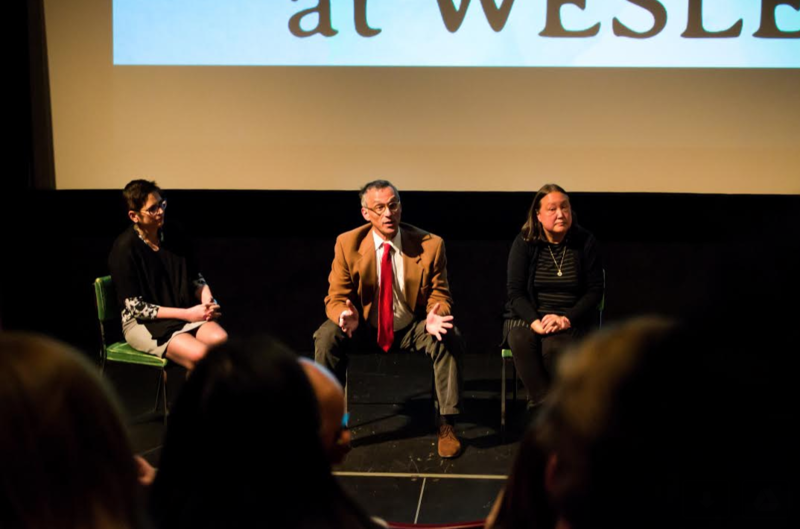 The University’s theater majors held a town hall to discuss the current state of the theater department with faculty, administrators, and students, on Monday, Feb. 13. Senior representatives Cheyanne Williams ’17 and Jess Cummings ’17 led and organized the event. Last year, Yuri Kordonski, former Chair of the Theater Department, left the University for a job at the Yale School of Drama. As a result, Dean of Arts and Humanities Ellen Nerenberg filled the place of Kordonski as interim chair of the Department. Nerenberg has never been involved in theater at the University, nor does she have any experience in the field. Since she has been chair, the department has not held any faculty meetings. In that same year, both Professor Emeritus Jack Carr and the Artist-in-Residence Leslie Weinberg retired, leaving the Theater department with only two full time faculty members. Theater students called for this discussion because the Theater department, as described by Williams and Cummings, is in receivership. This means the department has no tenure-track professors, no gateway courses to the major, and only two tenured professors when it should have four tenured faculty members, one tenure-track professor, an artist-in-residence, and a chair of the department. The student theater population has also grown; there were nine majors in the class of 2016 and now there are approximately 20 in the classes of 2017, 2018, and 2019. The town hall began with Williams and Cummings addressing the administrators as well as the audience at large. Williams also stated the goals of the town hall: to demonstrate the importance of the Theater department and its essential position in the University community, to ask questions and glean information from administrators, and to start a conversation about what the Theater department needs going forward. Cummings and Williams then invited six student representatives to the stage. These students gave brief testimonials regarding their experiences within the department. The next student representatives consisted of other theater students passionate about the Theater department. One even addressed University President Michael Roth himself. The Town Hall continued with alumni speaker Nick Benacerraf ’08. He spoke about his time as a student, and cited his grievances about the treatment the Theater department experiences within the University. Williams and Cummings proceeded to lead the audience in a question-and-answer discussion between Roth, Nerenberg, and Provost Jacobson. “To the administration in the room, is there a current plan in action to get a chair for the theater department and if not, why?” Williams asked. Provost Jacobson continued by saying that the administration would be grateful to have a chair of the Theater department, but until they deal with issues underlying the surface, they cannot hire a chair. President Michael Roth then stepped in. Students also stated their anxieties about keeping theater professors from leaving the University and their fears of not receiving the theater education they thought they were paying for. Students also demanded a more concrete plan regarding hiring a chair. The Town Hall concluded with words from Pulitzer Prize-winning playwright Quiara Alegría Hudes, The Shapiro Distinguished Professor of Writing and Theater.